Soldier’s Heart by Michele McKnight Baker is an epic story of friendship spanning the years of the American civil war. It starts at the end of the war, goes back to the beginning and works forward to finish on the day it began. It is a tale of two boys and their families – one white and one African American. Web and Junior are friends who see past the colours of their skin and look into each other’s hearts. They are friends forever. Blood brothers. The same cannot be said for their families, as there is a reserve in the older generation. However as the story progresses the reader learns how the lives of individual family members have intertwined over the years. 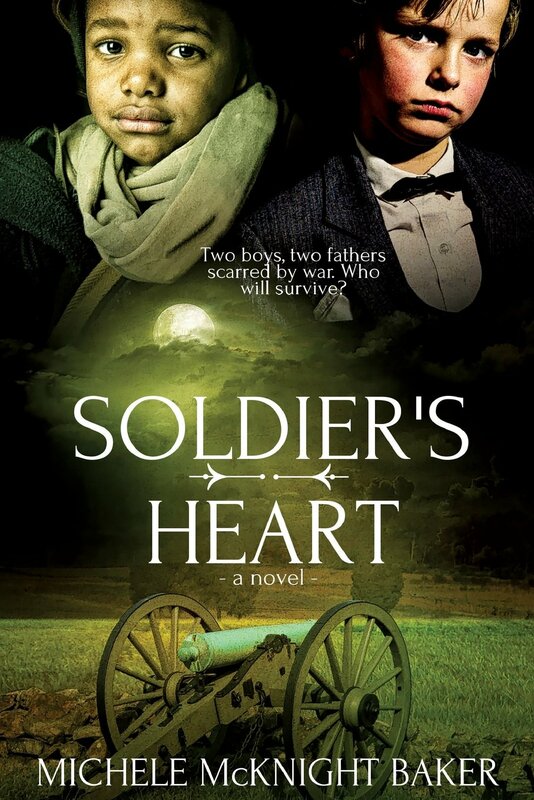 Soldier’s Heart is an amazing read, covering many themes. It shows the futility of war, especially it seems, civil war. Men kill men; men kill boys; boys kill men; boys kill boys. What’s left at the end is dead bodies and the guilt of the living. No one is really a winner in war. Racial prejudice rears its head. The war was partly fought because the south did not want to give the negroes their freedom. The army is not interested in having negroes fight either. Linked in to that theme is that of slavery. Web’s great grandfather Elisha Tyson is seen as a hero among the negroes. Mary Wilson, now an old lady, remembers being aged eight and freed by Elisha Tyson, saying “it only takes one person with courage to stand up and make a world of difference.” People need to stand up for what is right, regardless of what others may think. As a historian I found Soldier’s Heart a fascinating read. I was educated about some of the battles in the civil war. I was totally enthralled by the characters of Web and Junior. Oh that the world could be seen through the eyes of children. They look beyond outward appearances and into the heart. Soldier’s Heart did make for difficult reading at times. Michele McKnight Baker tackled the issues of war and prejudice sensitively. I was left at the end of the novel with a positive feeling from the bond of friendship rather than the negative impact of war. I can highly recommend this excellent novel. Julia, thanks again for this thoughtful review. Working on a sequel and also on an audio version of Soldier’s Heart. Any thoughts on stewarding Soldier’s Heart in UK are welcome. Reconciliation is a global theme, with spiritual and socio-economic impact, don’t you think?